This is still on the topic of the Grand Tableau, the second part of the workshop as I like to call it. The workshop will consists in applying the theory covered in the posts dedicated to this peculiar layout. You can easily access the theory by clicking in the category “the grand tableau” on the right side of the page. So this post will be related to the last 4 cards in the spread. In this example, the House, the Key, the Star, and finally the Crossroads. 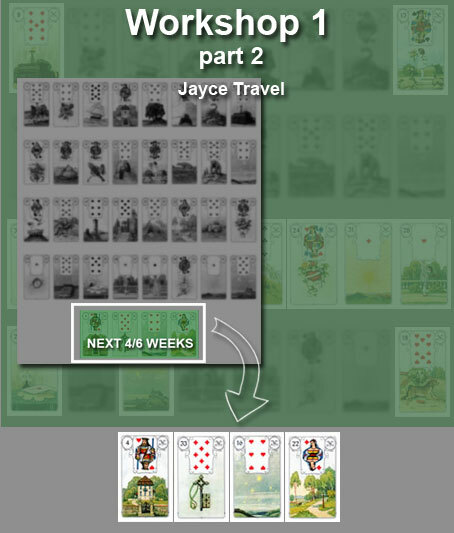 The way to read the cards is to divide this into 2 units : the part on the left, and then the part on the right. Finally one read the 4 cards into one single unit.